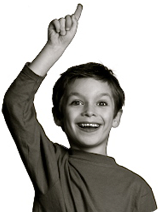 If you face a particular concern or your child has experienced trauma, give us a call. 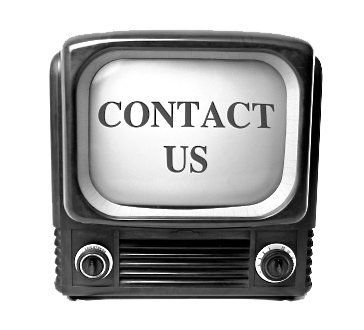 If you need urgent treatment after hours, you can call our emergency number. We are always here to assist when your child's dental health is at risk. Below are tips on dealing with discomfort and urgent dental situations. Groovy Molar and the American Academy of Pediatric Dentistry recommend that a child’s first dental visit be scheduled by his or her first birthday. Don't worry -- if you missed that milestone, it's never too late to get started. And before the age of one, we're happy to welcome you for a complimentary "get to know us" visit, to offer you pointers on taking care of your baby's teeth, and also to get your baby comfortable in our office and on your lap in the dental environment. Our goal is to gradually bond with your child, and to make her or him feel safe and secure on every visit to our office. Believe it or not, parents often tell us, "My child asks when we get to go back to the dentist!" 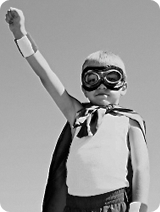 The earlier we can start building trust with your child, the better. It makes a great first birthday gift to your child to know you are on the right step to creating a healthy smile! For those kiddos coming for the first time at a later age, don't fret, we will get them caught up and ensure they are on the right track! At every visit, we will record your child’s dental findings and update medical history, complete a comprehensive examination and cleaning including age appropriate tooth pictures (radiographs), and discuss all information with you. We will also review the importance of maintaining a good dental health program with you and your child to ensure a healthy and beautiful smile for life! I often inform parents that their child's teeth are different than ours! Teeth are not just teeth. 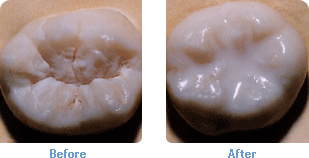 Baby teeth have very thin enamel, the hard protective outer layer, whereas permanent teeth have much thicker enamel. As a result of thinner enamel, it does not take much for a small cavity that may go untreated to turn into a large cavity that may need a pulp or nerve treatment along with a crown. And yes, baby teeth need crowns too. It basically boils down to how large the cavity is. That is one reason to respect those little teeth, they can get out of hand quickly, just like the behavior of our little guys! 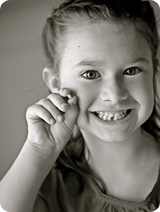 Many times when children complain of intense tooth related pain, it may be too late to save the tooth. This means that the bacterial infection has reached the nerve of the tooth. In this area there is no density, consisting of blood vessels and nerves. If the infection goes through the root of the tooth, then this process is manifested by an abcess, a swelling (liquid infection) in the gum tissue near the tooth. In these situations, the tooth must be "helped out for the tooth fairy!" 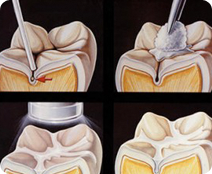 Because the teeth behind that tooth want to move forward and would block the eruption of the permanent tooth, then we must place a space maintainer. Just as if you are sick and don't feel well, your immune system must work harder. Just as with our bodies, in our mouth it is no different. If there is active/untreated decay present, it is more difficult for the other teeth to ward off those evil cavities (and especially of concern as we get those permanent teeth). 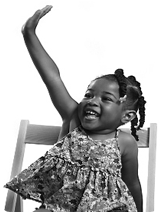 Parents often may say, "But she is the one that brushes 3 times a day, hardly ever eats sweets, and loves water! My son was the one I was worried about, he eats what he wants and brushes only once a day, on a good day! How did she get the cavities?" This happens, and it doesn't mean that you either get cavities or you don't. Just as some kids seem to be sick more often with ear infections or colds and others seem to never be sick, so is true with teeth. It is all a result of a bacterial infection, just different locations. You're right! They are going to fall out! Hopefully cavity-free, intact, and once the permanent teeth push them out! Baby teeth allow for the child to chew and eat properly, enunciate speech, and serve as an important path for permanent eruption, maintaining the necessary space for the permanent tooth to erupt. Decay can affect each of these processes in addition to causing a child pain, which often times goes unreported. 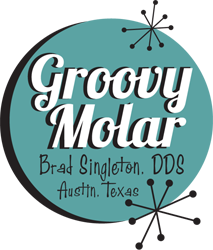 Dental sealants provide a great benefit to our groovy molars and premolars. The process is simple and involves "painting" or flowing a thin resin material into the grooves of a child's posterior teeth. The grooves of posterior teeth collect and harbor decay causing bacteria as well as food particles which break down to an acidic byproduct. These teeth are highly susceptible to cavities. Sealants provide a physical barrier from the bacteria and food particles entering into the grooves, thus allowing saliva and water to better wash the teeth and enabling brushing to be more effective (as the bristles of a toothbrush often do not reach into these microscopic crevices). Remember, sealants only cover the chewing surface of a back tooth, therefore flossing is critical to preventing decay between teeth! And to further alleviate any questions, Groovy Molar does not use any dental materials containing bisphenol a. 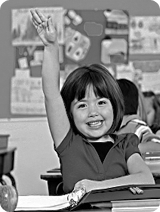 Please ask Dr. Singleton if your child is a good candidate for sealants. In some situations following dental extractions, your child may experience prolonged bleeding. If this occurs, it may be the result of a dislodged clot. The most important part of post-extraction is maintaining constant pressure on gauze. Take two gauze and fold into a square, then have your child bite down on the gauze for 20 minutes, replacing as necessary. It may be beneficial to place some gauze in the refrigerator for the cold to help slow the bleeding. If gauze pressure does not improve the bleeding, use a tea bag (preferably black tea- it is the tannins that have a hemostatic effect). Lightly dampen the tea bag under cold water just enough to get it moist. Place the tea bag over the extraction site and bite down, 15 minutes should be sufficient. If bleeding persists, head to the ER as there may be an underlying disorder. Following extractions, avoid drinking through straws, spitting excessively, or eating foods that may separate the clot (no chips, pretzels, etc., soft foods are best, and avoid hot soups as this may thin the clot). If your child's tooth has been knocked out of his mouth, find the tooth and rinse it with water (no soap) to clean any debris (place a paper towel over the drain), taking care to only touch the crown of the tooth (the part you can see when it's in place). Time is of the essence, so do your best to place the tooth back in its socket and hold it in place with a clean towel or cloth. If you can't return the tooth to its socket, place it in a clean container with milk. In either case, call us immediately. If you act quickly it's possible to save the tooth. If there is additional trauma of concern, a visit to the ER is best. If your child has bitten his lip or tongue severely enough to cause bleeding, clean the bite gently with water and use a cold compress if able (a cold, wet towel or washcloth pressed firmly against the area) to reduce or avoid swelling. Give us a call to help determine how serious the bite is. Generally, unless severe, this will heal on its own. 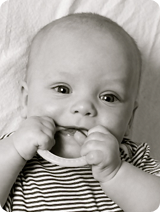 If you know or suspect your child has sustained a broken jaw, use a cold compress to reduce swelling. It is best to head to the hospital immediately (where an oral surgeon is on call). In many cases a broken jaw is the result of a blow to the head. Severe blows to the head can be dangerous and even life-threatening.